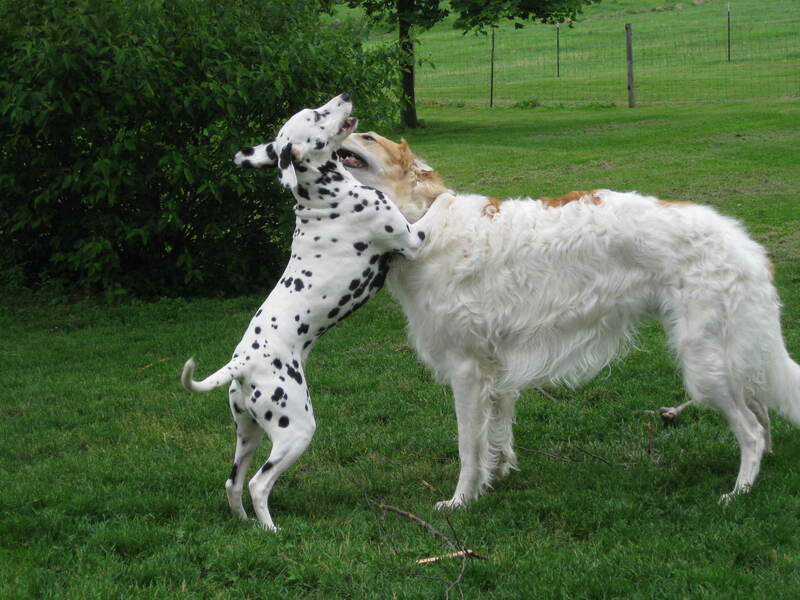 Dalmatian - Tali Ho | Canine Training<p>by Mystic Moon, Inc.
She's reminding JJ that around here she "is it". JJ just smiles. Tali Ho is our third Dalmatian. She, just like the other two, is full of energy, curious, and crusies at full speed through life. Thank heaven we have 3 acres fenced in! She also thinks pups are awesome, she absolutely adores them. Tali Ho is the perfect dog for Agility Demo Classes. It's so much easier for me to teach Agility, if I have a demo dog. She enjoys the attention, and loves the treats. She spends evenings on the couch, watching T.V. with her dad, Chuck. Tali Ho is our "watch dog". She takes her job seriously. Good Girl! And, is teaching EZ, our Saluki.